Pregnenolone, sometimes called the "mother steroid," is the natural precursor of all steroid hormones, including androgens, estrogens, corticosteroids, and others. Pregnenolone also acts on GABA receptors in the brain. Oral pregnenolone supports normal psychomotor performance in stressful environments, and may have cognitive and neuroprotective effects as well. Historically, pregnenolone has been used to support joint health. 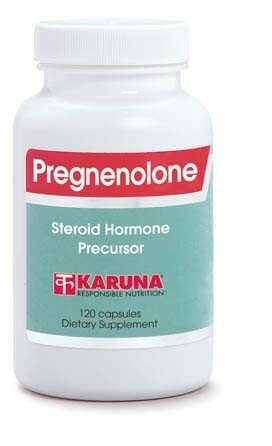 Pregnenolone serves as a precursor to important steroid hormones, including dehydroepiandrosterone (DHEA) and progesterone (J Steroid Biochem Molec Biol 1991;40:71-81). Low brain levels of pregnenolone have been associated with imbalances in the physiological control of mood and sleep (Biol Psychiatry 1994;35: 775-80). Pregnenolone interacts with GABA receptors to modify brain waves associated with healthy sleep patterns (Brain Res 1993;615:267-74). Pregnenolone may promote normal psychomotor performance and efficiency in stressful environments (Psychosom Med 1945;7:342-46; Aviation Med 1944;April:98-115). Pregnenolone may promote joint health according to older research (JAMA 1950;143:338-44; J Clin Encocrinol 1951;11:559-77). Suggested use for adults: 1-4 capsules per day in divided doses with meals, or as directed. Not to be taken by pregnant or lactating women. To be taken only under professional supervision by patients with a history of hormone-related conditions or a seizure disorder.